I got my iPad Air this morning a little after 9 a.m., and while I tried to gather some first impressions about Apple's new, lighter full-sized tablet while at the office, I really needed to retreat home to put it to the most important test: How does it work when I'm sitting on the sofa in my living room? 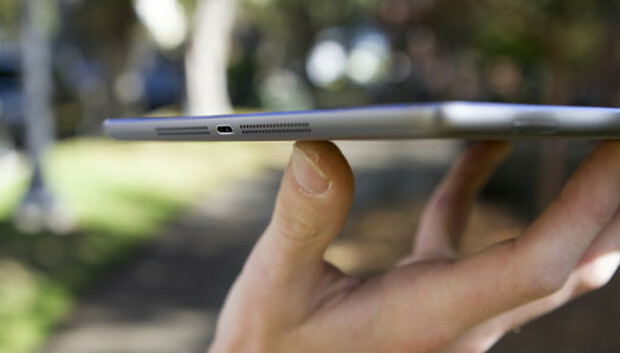 Most of my questions about the iPad Air are about its physical dimensions. I'm less worried about the A7 processor that powers it--I have no doubt it's going to be the fastest iPad by a vast margin and the fastest iOS device yet by numerous measures. But the ergonomics fascinate me. How much does shaving a little less than half of a pound off of the previous iPad matter? How much does narrowing the iPad by seven-tenths of an inch change things? Does holding the iPad Air feel more like the ultra-light iPad mini, or more like the old iPad? Good questions, and after a few hours I don't have anything resembling final answers. But I do have a few initial observations. In my past year as an iPad mini user, there were two kinds of reading that I basically stopped doing on my tablet: digital editions of print magazines and comic books. These are both formats that just work better with a larger screen, because everything is larger. The iPad Air's screen is simply closer to the intended page size of those periodicals than that of the iPad mini. I've got a JetBlue flight to Boston on Monday morning. When the plane is taking off, I expect I'll be reading a magazine or comic book, thanks to the iPad Air and some timely intervention by the FAA. I loaded the Comixology app and re-read a few issues of one of my very favorite comics out there these days, Marvel's "Hawkeye." The Retina screen is just as great as on the iPad 4--they made Matt Hollingsworth's colors pop and highlighted every small detail of David Aja's artwork. I held the iPad Air on the left edge in the center of the device's body, pinched between my thumb and index finger, and that was pretty comfortable. I also held it toward the bottom of the device, with my pinky extended as a "kickstand." I could definitely feel the extra weight of the Air versus the iPad mini, but holding the device with one hand was much more comfortable than it would have been on the old iPad 4. I think it's fair to say that iPad mini users will find the iPad Air noticeably heavier, not just larger. Whether the additional screen size (though not resolution--the Retina version of the iPad mini has exactly the same number of pixels as the Air, packed into a smaller physical space) merits a switch to the larger iPad is going to be a devilishly difficult decision. If you're a comic-book fan like me, or like to read those magazines with text that's just too small to be read on an iPad mini, the larger screen may be worth it. So iPad mini users might not love the extra weight. But for current users of the full-sized iPad, the iPad Air is dramatically lighter and noticeably smaller. My wife, who's currently using an iPad 3, was definitely impressed with the decreased weight. I know that a lot of iPad users consider portrait orientation the best way to use the iPad. It takes all kinds! But I'm not one of those people. I have always used my iPad in landscape orientation most of the time. I can't read comics in landscape, but my preferred Twitter client (Twitterrific) is much better in landscape, and I prefer Mail with my message list visible at all times. The list goes on. That all said, with the iPad Air I'm feeling much more generous toward portrait orientation. Simply put, by dropping the weight and decreasing the width of the device, holding the iPad Air in portrait orientation one-handed is pretty comfortable. It's not iPad mini comfortable, but it's close--and it's noticeably more comfortable than trying to hold the iPad Air with one hand in landscape orientation. In landscape, the iPad Air feels very much like the previous-model iPads. Sure, it's lighter, but it's still better with two hands or sitting in your lap. Also, though I've never been a fan of thumb typing on the iPad, it's much easier to do on the narrower iPad Air than it ever was on the previous full-sized iPads. On my first afternoon with the iPad Air, I had one moment that really took me back to the days before I switched to the iPad mini. At one point I wanted to answer an email, while sitting on my living-room sofa. I plopped the iPad Air on my lap in landscape mode (all the better to type with) and started to type--at a much faster speed than I could recall. There is something solid about the ergonomics of the iPad Air (and the previous full-size iPads) laying in my lap. It fits and is stable in a way the iPad mini never has been, and the keys are large enough that I can type at a much faster pace. The iPad Air felt like a tiny, single-planed laptop as I zipped through that email, in a way the iPad mini never did. Is the iPad Air really capable of long-term one-handed use? That's going to take more than a few minutes or even a whole afternoon to determine. So I'll do more reading on the iPad Air, as well as running some benchmarking apps and the like. I'm also going to try to answer your questions, so if you've got any for me, leave them in the comment thread attached to this story, or tweet them to @jsnell on Twitter.